← Truly global vocabulary needs ‘untranslatable’ Chinese terms; Most people believe that the secret to promote Chinese culture is to have as many foreigners as possible studying the Chinese language. There is a better way. To the dismay of wives and mothers the world over, huge numbers of men and boys adore powerful vehicles and big guns. If you put the two together, you have tanks. This insight has help­ed Victor Kislyi build one of the world’s fastest-growing computer game developers. Mr Kislyi’s Belarus-based Wargaming.net is the creator of World of Tanks , the online game in which players get to drive a second world war-era tank and engage in team battles on an accurately depicted terrain or in city streets, using detailed and realistic maps.The appeal of driving a multi-tonne monster with a powerful cannon that blows up anything and everything – trams, buildings and other tanks to start with – has struck a chord. More than 60m people (98 per cent of them male) have downloaded the free-to-play game and about a third of those play regularly, making World of Tanks a behemoth among massively multiplayer online games, or MMOGs, in which large numbers of players can participate simultaneously. Mr Kislyi’s eighth-floor office in Minsk looks out over the flat Belarusian countryside, where thousands of Sov­iet and German tanks duelled for supremacy in 1944, when the Red Army finally broke the back of the German war machine. “Tanks are cool,” says Mr Kislyi, who at 37 was born long after those battles ended. Wearing a well-cut open-neck shirt and a big grin, he looks nothing like a hard-bitten warrior. He does have something to smile about, though. 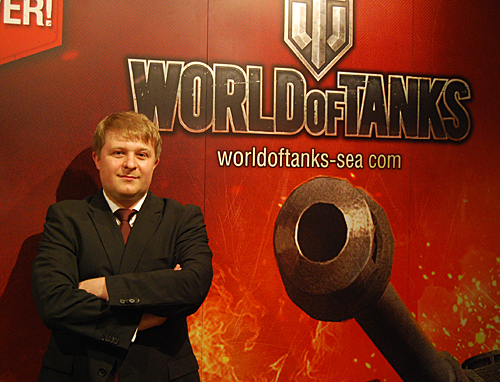 His company has 1,600 emp­loyees, up from 120 three years ago, and revenues have soared from €18m in 2011 to €218m last year, all thanks toWorld of Tanks. That makes Wargaming.net a rare success story out of Belarus, better known as Europe’s last dictatorship. While Belarus’s politics have made it the subject of EU and US sanctions, its 12 per cent flat-rate tax (9 per cent for companies in special economic zones, such as Wargaming) and the highly trained but inexpensive programmers churned out by its universities make it an attractive base. “We are a company that has generated more than 1,000 good jobs,” says Mr Kislyi, now head of one the biggest private companies in a country where the state controls three-quarters of the economy. It has taken almost two decades of hard work by Mr Kislyi, who owns 64 per cent of Wargaming with his brother Uladzimir, while two friends, Nick Katsleapov and Ivan Mikhnevich, control the rest. His first love was chess, the pastime of choice for the educated elites of the Soviet Union. But computers kill­ed his love of the game. “There was no future in chess after one defeated the world champion,” he says. ● Victor Kislyi says his version of an MBA was playing ‘Civilization’, a computer game in which a player starts in the stone age and using politics, arms and economics advances to the space age. “Playing it made me a businessman. It’s sophisticated, relatively long and has a finely balanced economic system – and it’s fun!” However, he has signed up for a course at Insead business school to gain fresh insights into overseeing expansion. ● The founder of a games developer must hand over design to others at some point. “I realised these people would do it better and it freed me to concentrate on building this as a business. Most small gaming companies eventually fail because they have passion but they don’t focus on business,” Mr Kislyi says. Mr Kislyi, who studied physics at university, turned to computerising a war game he, his brother and friends had developed on the linoleum floor of his scientist parents’ flat in Minsk. The result in 1996 was Iron Age, an MMOG of conquest that drew a global audience of a grand total of six. “And that included me and my brother,” says Mr Kislyi. But they persevered. After two years they released an online game aimed at players of traditional war games using detailed miniature figures. The idea was to create pedantically precise computer vers­ions of 1,300 warriors from the bronze age to the Middle Ages. “The niche was so niche that none of the big companies had touched it,” says Mr Kislyi, toying with tin figures of a samurai warrior and a Greek hoplite on his desk. This game generated a few thousand dollars a month, enough for the team to think they could earn a living as game designers. Wargaming was set up and the first employee hired, on $25 a month. To hedge its risk of running out of money between games, Wargaming developed a program to manage online banner ads. The spin-off was acquired by Yahoo, which generated about $10m. “We could have bought a Ferrari and a villa but we were happy we had money to fuel the gaming side,” Mr Kislyi says. The next game, Order of War, did well but left a bitter taste because of battles between the developers and the publishers, the big companies res­ponsible for selling boxed versions in shops around the world. “This was a digital product that was being sold on a shelf in a shop in a same way that products were sold in Babylon 5,000 years ago,” scoffs Mr Kislyi. World of Tanks launched three years ago with a business model in which the game is free but players are encouraged to pay to advance more quickly, as well as buying decals and extra decorations for their tanks. About a quarter of users pay. The model is relatively fragile. If free users sense that those who pay have gained a disproportionate advantage, they quit, but those who pay must have a sense they are getting something for their money. For now Wargaming has hit a sweet spot. Peter Warman, chief executive of Newzoo, a games market analysis firm, says World of Tanks has managed to extract money from its users at a faster pace than any other MMOG. “Their performance on monetising and revenue per player is what sets them apart from any MMO game,” he says, pointing out that the rush of earnings is likely to grow even faster as the game gains popularity in the US and Asia. One floor above Mr Kislyi’s office, a developer peers at a computer screen, tweaking the details of a Soviet tank. Next door, a programmer adds trees and bushes to a map of the Korean countryside, aimed at the company’s fast-growing audience in the Asia. The company now has offices in France, the US, Germany and South Korea, and deals with partners in Vietnam and China. It has also bought Big World, the Australian group that built the core of its gaming software, for $45m. Developers are putting the finishing touches to versions of World of Tanks for warships and fighterplanes, as well as a mobile app. “We can feel the pressure of the next big thing,” Mr Kislyi says.